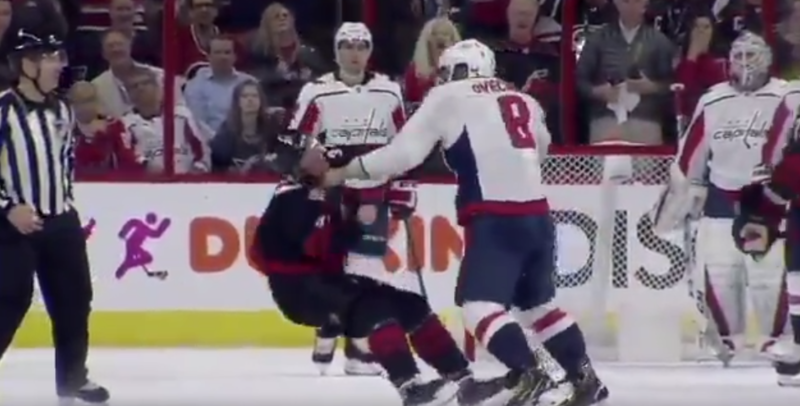 There's debate over whether or not Ovi pushed Svechnikov down onto the ice, but the slow motion replay looks like he may have just lost his balance. He's done a little bit of everything for the Capitals this series, tallying two primary assists in Saturday's Game 2 win, scoring a goal in Game 1 and now recording the first fight of the matchup. They traded blows before Ovechkin caught Svechnikov with a knockout punch to the side of his head. Per the Raleigh News & Observer, he's out for the rest of the game. In addition to his Game 3 fight, Ovechkin has now fought four times in his National Hockey League career. For Svechnikov, the No. 2 pick in last year's draft who helped lead the 'Canes back into the postseason, it was his first in the big leagues. Svechnikov's brother Evgeny, also a pro hockey player, issued an ominous warning on his Instagram story, tagging Ovechkin and writing: "One, two, Freddy's coming for you".